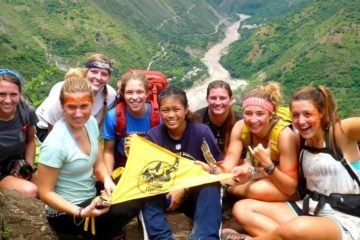 Choquequirao to Machu Picchu trek, According to the specialists, it would have been a religious, political and economic enclave as well as a commercial and cultural link between the coast, the highlands and the jungle built during the command of Inca Pachacutec. It is divided into nine sectors and its architecture is distributed around a large area or main square. 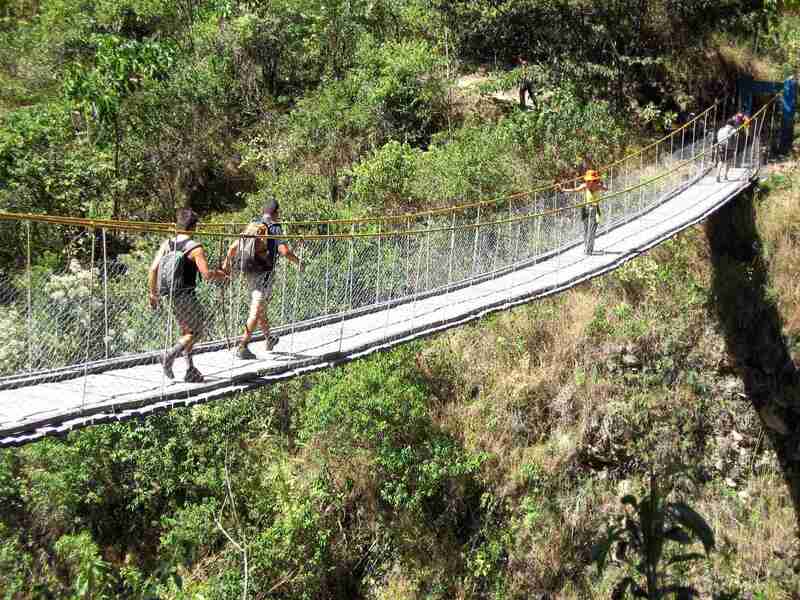 It includes hundreds of agricultural terraces, rooms and irrigation systems.It is located in the district of Vilcabamba, on the skirts of the snowcapped mount Yanacocha, in the province of La Convencion. The highway to Abancay gets you here from Cusco. In kilometer 154 the tour is taken to the town of Cachora; there a 30 km. road made on horseback or trekking takes you to the archaeological center that has an importance comparable to Machu Picchu. We will leave Cusco early in the morning at about 5:30 am. First we will head for the little village Cachora (2850m/9350f), a nice place surrounded by beautiful mountains and the majestic glacier Padreyoc (5571m/18278f). Here, we will also meet our horsemen who will accompany us during the trip. After having passed the overlooking Capuliyoc (2800m/9186f), we will continue descending to our campsite called Chiquisca (1930m/6332f). 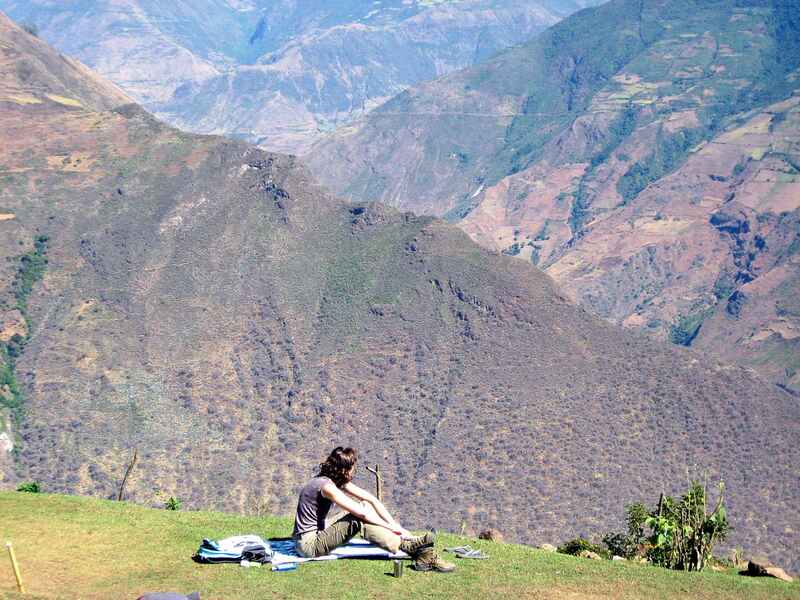 At dawn, we will first head for the citadel of Choquequirao (3033m/9950) called “Cuna de Oro” – the ‘Cradle of Gold’ – and enjoy the quietness at this place. 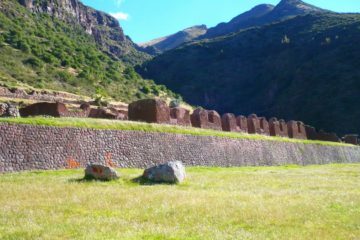 Beyond, we will explore this archeological site, of which only 30 % is restored, in more detail: we will visit the section of the palaces, the liturgic fountains, the temple of the high priest, the section of the llamas and the Ushnu. Thereafter, our trek continues towards the pass of Choquequirao (3270m/10728f) and passes the archeological site of Pinchaunuyoc (2450m/8038f). Finally, we will head down to the deepest point of the small canyon known as Río Blanco (1900m/6234f) or Río Silvestre where our camping site is situated. 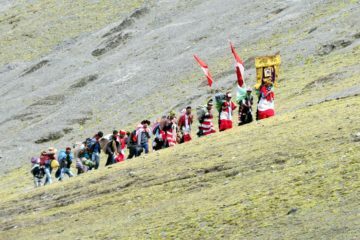 Early in the morning, we will head for the highest pass of this trip – the Yanama (4670m). If we are lucky we will even see a condor fly. During the day, we will enjoy frequently the view of snow capped mountains such as Salkantay (6264m/20550f) and Pintuyu (5450m/17876f). 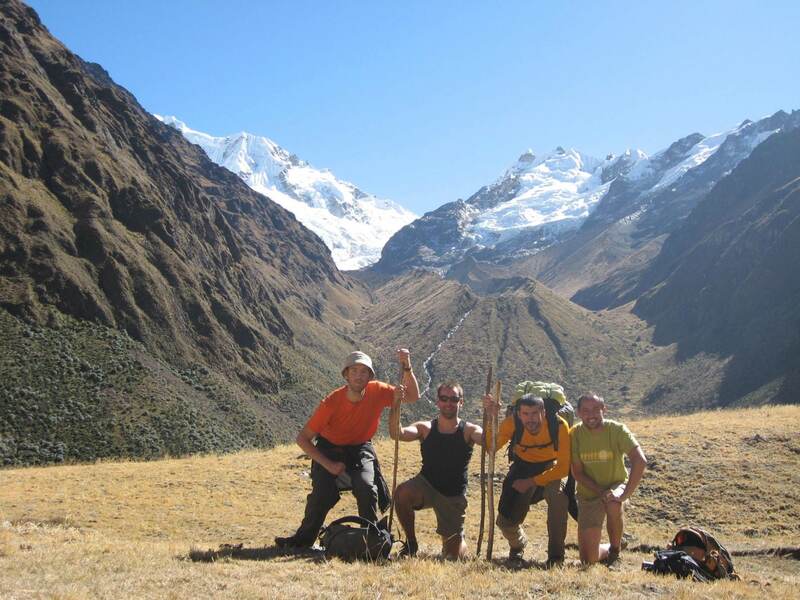 Our camping place will be in the valley of Totora pampa (3200m/10496f). In Totora pampa we will get the chance to meet Quechua-speaking Andean people who live from agriculture and cattle breeding. The vegetation on our way gets more and more bizarre and reveals its diversity of orchids, bromelains and other plants. We will also see some plantations for coffee, papaya, passion fruit and avocado. Our camping site will either be in La Playa (2100m/6890f) or in Lucmabamba (2020m/6627f). Our journey starts early in the morning. 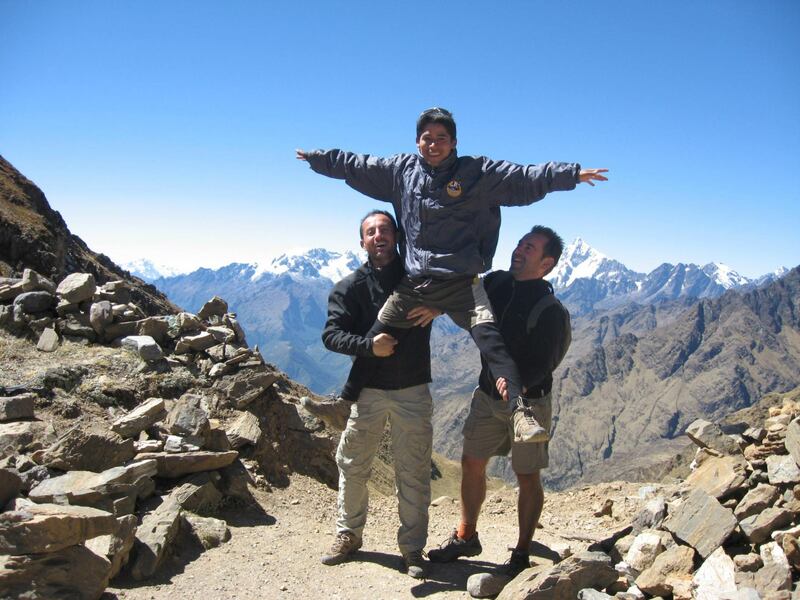 First, we will follow the Inca Trail till Llactapata (2650m/8694f). This archeologic site is situated amidst a bizarre vegetation and offers an exceptional view of the mountain Machu Picchu. Our trek continues towards the hydroelectric station (1950m/6398f) from where we will take the train to Aguas Calientes (2050m/6726f). In Aguas Calientes we will spend the night in a hotel. We will leave our hotel after breakfast at 5:30 am and head for Machu Picchu (2400m/7874f) by tourist bus. We will arrive at the citadel around 6:00 am. After a guided tour around the archeological site, including information about life and culture of the Incas, you will have enough time to enjoy Machu Picchu and Wayna Picchu (2750m/9022f) on your own. We will leave Aguas Calientes by train either at 2:55 pm or at 6:10 pm. Until then, you will have time to have lunch in one of the nice restaurants. Moreover, you can visit the hot springs in Aguas Calientes to relax a bit. 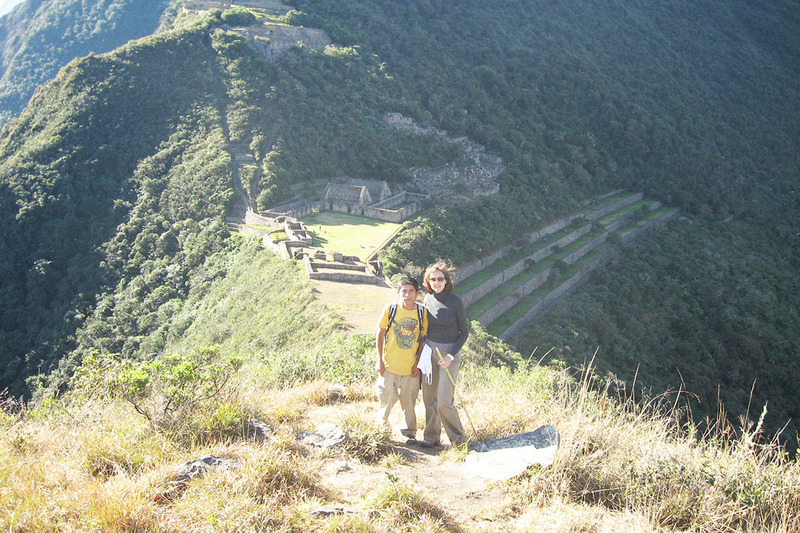 Here finish Choquequirao to Machu Picchu Trek.